I can't believe I almost did not go to this. I was tired, feeling unmotivated. But friends would be there, friends would be *in it* and I thought at least I'd buy a ticket, even if I decided not to go. The show was ridiculous. It took place at the Lobero on Tuesday, 8 June, to a full house. La Petite Chouette is now my favorite dance company in town. It's directed by Ninette Paloma, and classes are in her studio space down in the funkzone. There, Santa Barbarans learn aerial arts. YES, the trapeze, dangling fabrics, that hula hoop thingie that dangles from a rope, swinging on ropes, contortions...a bit like Mummenschanz but in the air and slightly more racy. No, a lot more racy. The first act was made up of youth students, nobody over 17 years old. It seemed like a muscial scene from a Jeunet film, of saturated colors, beautiful costumes, and flowing bodies turning in all directions but fully under control. 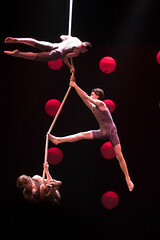 The youngest girls, Zela Goettler, Luna Webster and Jezebel Kenney, shared the Lyra in closely coordinated body movement while the other performers sat quietly below and watched. This was followed by three boys, Harley Murray, Malcolm McCarthy and Spencer Glesby working together in formations for the Corde Lisse. Beautiful! Sophia Phillips and Zola Phillips paired up for contortions on a simple metal bar in the center of the stage, sometimes symentrical, sometimes asymetrical - always balanced and in sync with each other. 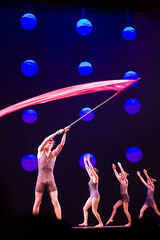 Russ Glick, who may have been the oldest of the male troupe, has solo time on the aerial fabrics. I've mainly seen women on fabrics, so this was a treat to me and undoubtedly the whole audience. One of the most beautiful performances of the first act came with a male and female pairing: Ben Murray (who lost his shirt...?) 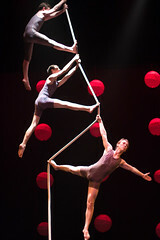 and Sophia Phillips together on the trapeze, balancing and holding each other with seemingly little effort. Act Two brought out the adults in the dance group, and primarily accompanied by sensually beautiful acoustic guitar by Chris Fossek. 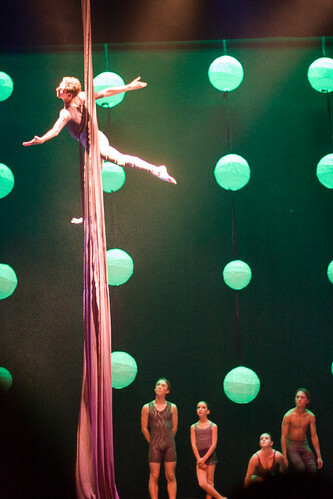 First on the stage was the lovely and talented Jamie Bishop as the central figure on the Lyra, with other dancers below her. Jamie may also have had the biggest fan club present that night, and I admit: I wouldn't have even known about this event if it wasn't for her. Jamie, you surprise me every day and in the most awesome ways! Next, Helen Dickson, Joanne Terry, Serra Benson and Livia Mezei took to the hanging fabrics. What can I say, it was awesome. I feel like I'm just writing info gleaned from the program, and maybe I shouldn't write anything at all. Maybe the pictures should just speak for themselves. Maybe I need to wrap this up. Emily Garvin took the stage in darkness, suspended from wrapped fabric and seemed to just float once the lights came on. Unpictured: Nola Phillips with the Silk Sac, and Ninette Paloma on Trapeze. It lightens my heart to see so many people, young and older, fully embrace these sort of "lost" arts, and do it gracefully and proudly. And from our little Santa Barabra, who knew?? The performance was amazing, and think about this: it was sort of the equivalent of a piano recital. You know, when all the students put on their little show at the end of the year. 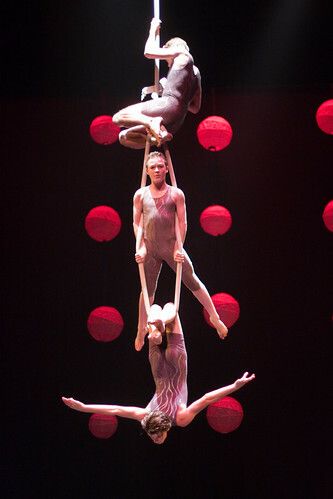 But the audience was truly mesmerized by the aerial talents of our fellow Santa Barbarans. What an inspiration! If you missed it, I am sorry. It was one night only. wow. that does look pretty racy. and beautiful!! their website is lovely too. I'm glad I'm not the only one who feels lazy like that from time to time. It's always rewarding to get out!! 1. featured. 2. bummed to have missed it. 3. awesome writeup! 4. you really do have a knack for photo-taking. That seemed like a pretty good event. Nice pics, glad you motivated to see it. It's a good example to follow! You misspelled Jezebel Kenny. "Kenny" only has one E.